Rain has settled to a sprinkle. But I'm still getting a good lightning show (a flash every 3-5 seconds). Bonus for March. A really spectacular day Meteorologically speaking. That was the most supercells I ever remember seeing in one day, going back to late 2013. Nonetheless most of it happened in the OV! It looks like some significant tornado damage was done in western KY, southern IN, Michigan, and Alabama, but today could've been much worse if instability was greater. 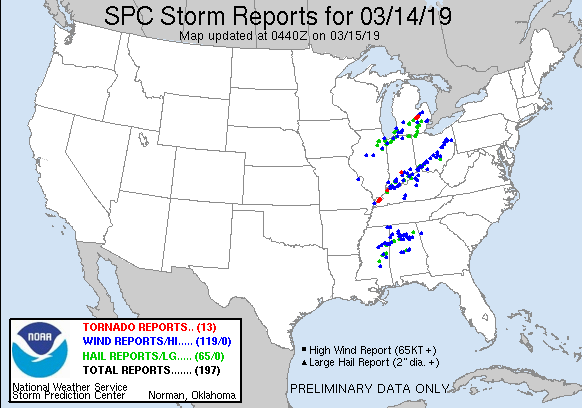 I can imagine this event was sorta like the 1974 Super Outbreak with the semi-discrete supercells and multiple seemingly unconnected bands of severe weather... except, you know, we had like one-sixth of the instability as April 3. Also, this was our first enhanced risk since November 2017. This was our greatest tornado threat since July 2018. Hello all, I'm a long to lurker from Accuweather and now this site. Thanks for all you do on these forums; a lot about what I have learned about weather has come from reading your posts! I've been meaning to get more involved on here for a while, I figure now is a good as time as ever. I like to analyze events like these in order to learn for future events. What was the limiting factor in the tornado potential in E. IN and W. OH/KY this afternoon? There was decent CAPE for such a high shear event (over 500 in the ILN sounding). Was it mostly attributed to low dew points at the surface (mid 50s on the ILN sounding)? I saw some mets tweeting that the cloud bases were too high. Is it correct to assume that this is caused by a lack of surface moisture? I'm glad nothing materialized more than it did. There were still some great storm structures to look at around here! New Mexico is the secret, I swear. Anything that can conquer the semi-permanent dryness and subtropical high of the deserts is big trouble for the rest of you. I'm happy you have been enjoying yourself too, I didn't want to get your hopes up too much in January, but March looked like an incredible pattern to me when I did my analog analysis. Thanks for all the tidbits on dates and stuff because I’m terrible with dates 😂😂 but I knew it had seemed like forever since we’ve had this kind of potential around. Great day of tracking even though I had to work I kept up. Glad everyone stayed safe as some big time storms were close to quite a few of us today. Good day all around here for me with the 2 hail producing storms. Well done. It's gonna be weird to not have anything to track for a bit. At least it'll be nice and sunny weather. End of the day severe weather reports. 11 wind damage reports are tagged with "possible tornado", all of them in Alabama. 250 YARDS. POSSIBLE TORNADO DAMAGE. It did a fair amount of light damage, roof from a church ripped off, garage door blown in, windows busted out, awning of a gas station torn off, and of course lots of trees and tree branches down. SPC's MCD for down south shows they think there's a dryline that has made it to our longitude. Indeed, there appears to be a pre-frontal boundary that's mostly a dew point gradient ahead of the cold front. Very rare, I think only happens a few times every decade. Going through weather observations from CVG, DAY, Memphis, Columbus (MS), Birmingham, and Huntsville... the strongest dryline-like signature I could find was in Cincinnati and Dayton. We saw the dew point drop by 12 degrees with only a 3 degree drop in temperature. All the other stations saw either a much more subtle drop in dew point or just normal cold front behavior. I really thought sw Ohio really was gonna get his hit bad with tornadic storms that were going through Indiana definitely got some strong ones close to cincy! I know we had most ingredients in our favor any thoughts on what exactly may have caused that? The only possible thing it could've been is moisture. ILN warned of this possibility in their Wednesday AFD. I think there was too much sunshine for the magnitude of moisture advection. Sunshine induces convective motions... air heated near the surface by the sun naturally rises... cool, dry air from aloft sinks to the surface. 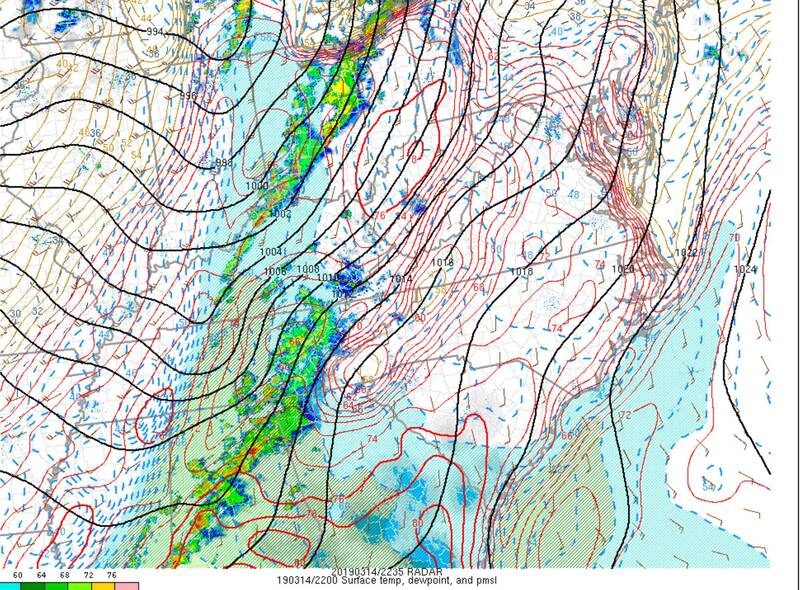 Without enough moisture advection, the low-levels can warm and dry as a result. The very dry low-levels was seen in the 19z ILN sounding. Also, mixing allows winds from aloft to transition to the surface... and more sunshine than was expected would explain why we were upgraded from wind advisory to high wind warning on the day of the event. Also, we had all those supercells and damaging winds was the main result from them... clearly. Damaging winds is usually the main threat when you have dry low-levels. It's very rare to have an event that favors supercells on such a huge scale (from Michigan to Alabama), even more rare to have the supercells become semi-discrete and that long-lived. This could've been a big tornado event if there was more moisture. sustained winds past the mid-morning hours into the afternoon. evening hours for the western three quarters of the local area. parts of west-central Ohio and east-central IN. environment, certainly brings a level of concern to the table. very potent during the time frame of interest. parts of the OH Vly if current hi-res data trends continue.